A member of the public has voiced their disgust at a new sign which has appeared in the Moygashel area of Dungannon, telling just-buried Martin McGuinness to 'rot in hell'. The message, which is painted onto a wooden board, also carried the words: "Moygashel celebrate the death of the Bogside Butcher." As well as the transcription, the poster features an image of the Grim Reaper in front of two Union flags. 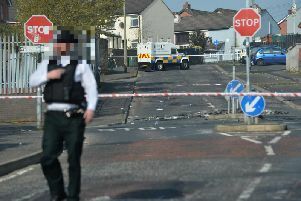 A person - who wishes to remain anonymous - hit out at the image, which they said they found "disgusting" the day after the former deputy First Minister was laid to rest. "I just think it's disgusting - at the end of the day a family are grieving," they said. "It's just such a bitter statement to make after such a show of togetherness yesterday." It is not clear how long the placard has been attached to the wall, but nor is it the first the village has drawn criticism for statements put up in the vicinity. In 2014 police investigated a sign on the very same wall warning landlords in the area not to lease their properties to 'foreign nationals'. The PSNI's Chief Inspector Roy Robinson said: "Police are aware of an offensive poster that has been erected in the Moygashell area of Dungannon and are working with people in the community to have it removed." "Mid Ulster MP, Francie Molloy said, "As tens of thousands of people gathered in Derry to pay tribute to the life of Martin McGuinness, including Unionist leaders, US President Clinton, Irish Taoisigh (past and present) and representatives of the British government it is sad to see that a small corner of Loyalists have not moved away from the 1970s mentality that festered in the murder Triangle of East Tyrone and north Armagh. "I call on the Unionist political representatives in the area to show leadership and call on the PSNI to have this removed without delay. Surely it falls within a hate crime. unfortunately this simply reflects badly on Moygashel and even the nearby Linen complex that attracts visitors and shoppers from all parts." *Sinn Féin MLA Michelle Gildernew said the picture stands in stark contrast to the dignity and respect shown for Martin McGuinness yesterday. The Fermanagh South Tyrone representative said: “This picture stands in direct contrast to the events yesterday where tens of thousands came from across Ireland and the globe to pay respects to a political leader in a dignified manner. “No one did more for the peace process than Martin McGuinness. “His outreach to everyone regardless of race, gender, class, religion or sexuality was an example to us all and he continually worked to build a better society based on respect, tolerance and equality. “There is a family mourning the loss of their husband, father, grandfather, brother, uncle and indeed many mourning the loss of a friend. “I condemn this vile behaviour in the strongest way possible. Actions like this cause concerns and problems for society." While local DUP councillor Kim Ashton said: "I am aware of the sign and am working with the community to try and come to a resolution."